When should young dancers start doing pointe work? Dancing en pointe is something a lot of young dancers aspire to be able to do. Starting pointe work too soon can increase the risk of injury. Therefore, telling a young dancer (or their parents) that they’re not ready can be difficult. In this blog post we’re going to look at the aspects dance teachers need to consider when suggesting dancers start pointe work. Pointe shoes were first developed in the 19th century. They were developed by the father of ballerina Marie Taglioni (Figure 1) in a bid to showcase her talents and make her appear weightless and graceful on stage. These early performances used a system of guide wires to move dancers up, down and across the stage. This gave the illusion that dancers were floating on their toes. However, modern pointe shoes are often associated with the 20th century Russian ballerina, Anna Pavlova. She made modifications, such as adding toughened leather soles for extra support and flattening and hardening the toe area to form a box. With the exception of two or three manufacturers, modern pointe shoes aren’t too dissimilar to those used by Pavlova. Most ballet dancers today have their pointe shoes customer made, tailored to their specifications. Is there an optimal age for pointe work? More research has been conducted on the effects of using pointe shoes in dance than for any other footwear. The impact of biomechanical stress on the growth plates in the feet of young and growing dancers is of particular concern. This is especially important in terms of the growth plates in the big toe (Shah, 2009). Figure 3. Beautiful example of arabesque en pointe with elegant alignment of the knees and feet by dancer, Karen Kain. The age are which dancers should start pointe work (Figure 3) is a common question. Guidelines on the multiple signs of readiness for dancing en pointe have been put forward. Despite this, age remains one of the most common deciding factors. Many researchers have reported an average age of 11.2 years. However, this isn’t a sufficient determinant of pointe readiness. Especially as this age coincides with the beginning of the adolescent growth spurt. Chronological age is not a suitable representation of physical maturation. Other factors also need to be considered for the prolonged health and well-being of young dancers’ bodies. For more information on maturation, read our blog post from Dr Melitta McNarry, Maturational threshold in young athletes. Young girls who are considering the transition to pointe work usually experience individual physical differences. This can include their feet, which must have sufficient strength and flexibility for pointe work. Therefore age is not the sole criterion to determine whether a dancer is ready for pointe work. It must be a careful, informed decision that the dance teacher makes in cooperation with the dancer and their parents. Back in 2016, we wrote a blog post that saw professional dancers warning of the dangers of starting pointe work too early, Dancers warn against en pointe for young children. Ballet dancers that have been studying for 3 to 4 years, often progress to wearing pointe shoes in class. It can be an exciting time for young dancers. However, it can also be a time that leads to injury. A crucial method for minimising injuries during the transition to pointe work is for teachers to train dancers using progressive strengthening exercises for the feet, legs and core. In addition, dancers might benefit from wearing demi-pointe shoes as an intermediate step between soft ballet flats and pointe shoes. Although, it’s important that teachers don’t see these shoes as a replacement for proper strengthening. 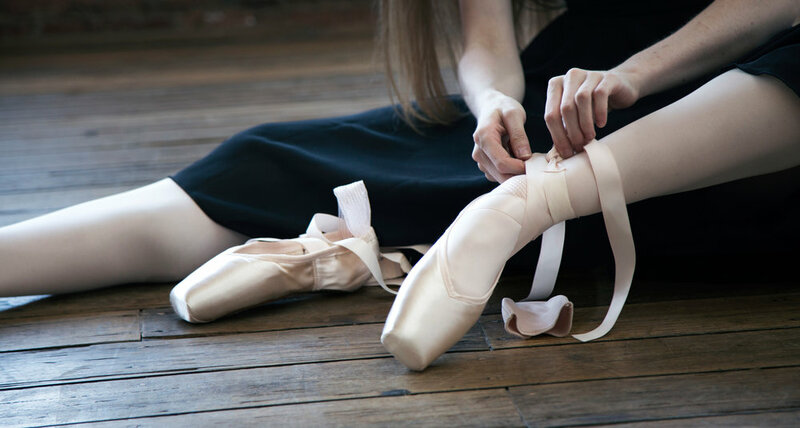 The rest of the body balances on the feet, so making sure pointe shoes fit properly is one way of preventing injuries. Stress reactions of the metatarsals can occur when the shoe is too narrow. This compresses the metatarsals together and can cause an enlargement of the nerves between the toes. When pointe shoes are too wide or too long, the foot has reduced support and can slip forward. This improper fit can lead to an outward angulation of the big toe. It’s a condition which is associated with bunions on the joint where the big toe meets the foot. Once en pointe the dancer must have strong enough ankle stability to not sickle. This position increases the chance of ankle sprains. It can also cause malalignment of the cuboid bone as it sits between the heel bone and the metatarsals on the lateral foot. Similarly, a dancer mustn’t bear weight on a foot in a wing position when en pointe. This position can lead to a Lisfranc sprain. The Lisfranc joint and its supporting ligaments that cross the mid-foot are crucial for dancing en pointe. Dancer Wellness details more ways that dancers can minimise their injury risk. Overall body alignment and postural control – Can the dancer control the trunk and pelvis in static balance and complex movements? Strength of the lower extremities – Can the dancer maintain the turnout of their hip joints as they move up to full pointe? Can they relevé without their feet and ankles wobbling? Are they able to confidently bear weight and control their lower extremities to work safely en pointe? Flexibility of the lower extremities – Can the dancer’s ankles and feet achieve a fully plantar flexed position with their knees straight? Hypermobility – Is the dancer hypermobile with loose joints in the foot and ankle and an overpointed foot? Is the knee excessively hyperextended, causing an even greater degree of plantar flexion at the ankle and foot? Hypomobility – Is the dancer hypomobile at the ankle and foot? If one extends a line from the tibia, is it parallel to a line from the top of the foot to the floor, or does the dancer need to slightly bend the knee to achieve the pointed foot position? If a dancer is excessively hypermobile they will require strengthening exercises for all the muscles of the foot and ankle. This type of proprioception is beneficial to all dancers, not just those preparing for pointe. Performing a relevé on each leg, with the gesture leg in passé. Ideally, dancers will complete this without the support of a barre. They should have maximum balance control and suitable alignment. Presence of excess lumbar curve, sickling or winging of the standing foot or misalignment of the foot, ankle, knee, hip kinetic chain denotes unsuitability for pointe work. A strong and well-trained dancer should be able to hold this for 30 seconds with their eyes closed. Performing a grand plié in various positions (e.g., first, second, fifth). Ensure the trunk remains stable; the alignment of the foot, ankle, knee and hip is appropriate; and the weight is equally distributed between the ball of the foot. Executing a pirouette on relevé with the gesture leg in passé (known as the topple test). This should be possible with controlled balance, including recovering effectively from the turn to complete a controlled landing. More assessment techniques for gauging readiness for pointe work can be found in Safe Dance Practice.